/ Is This Really Desensitizing A Foal? 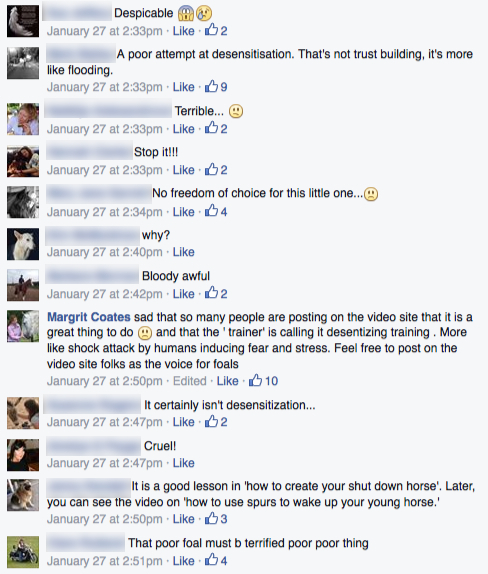 What is truly sad about this though, other than the treatment of the poor foal, is the fact that because the Facebook Page concerned is censoring any negative comments, the poor, uninformed commenters on the original video are prevented from seeing a different viewpoint. Most people do want the best for their horses and for horses in general but the problem is they don’t know what they don’t know and they can’t see what they don’t have the eyes for. I’ve been witness to such revelations before and it often doesn’t take much for people’s paradigm to change in an instant. In the case of the video, perhaps all one might need to ask is, “Would you treat a young child like that?” or “Do you think this exercise builds or shatters trust?”. 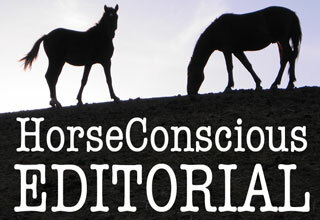 The challenge we face as ‘horse conscious’ people is that not only are there a lot of entrenched views out there (“It’s always been done like that”) but there is also much defending of territory such as the censorship exhibited by this particular Facebook Page. As you have so often recommended to me though, we must stay on the positive side and continue to demonstrate what is possible when you develop a true partnership with a horse based on trust and respect. Eventually others who do not share this paradigm will stop and stare and wonder if they can achieve that too and in that moment, the world for horses changes for the better. As usual, we would love to hear your comments below.